MAGFest! This year was my second time going to the Music And Gaming Festival, held in National Harbor, Maryland near Washington DC. If you’re one who has never seen or heard of this festival, I highly recommend it. 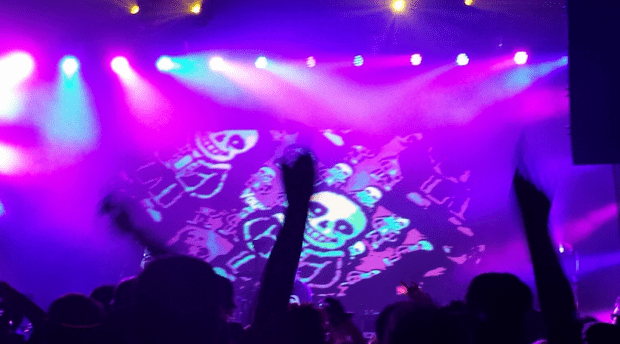 There’s great concerts, awesome cosplay, and of course… video games! I was really impressed by the energy and enthusiasm I saw during the MAGFest Indie Videogame Showcase (Called MIVS, for short). The first thing I noticed: tons of games I hadn’t played before! The floor was full of independent developers: some who came from just up the street, others who came from faraway locations, all there to show off their stuff. Here’s a quick roundup of a few of the things I got to play. A game that caught my eye early was Combat Core. Described by its creators as a throwback to the N64 or Dreamcast era, it plays a little like Power Stone, a big multicombat arena fight. 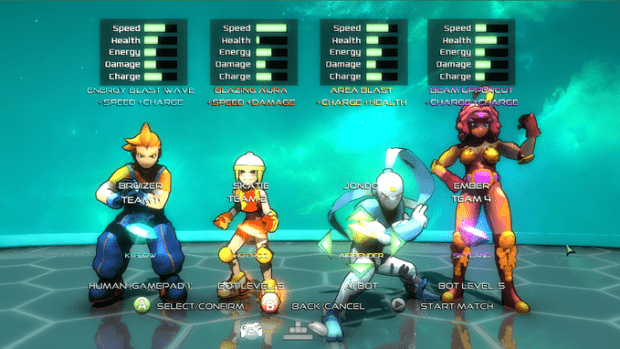 Where Smash Brothers and other team battlers tend to take place in a 2D space, Combat Core happens in a 3D space, with several different arena layouts and lots of cool anime-inspired characters. A big colorful smashup is always a treat at a show where you can challenge strangers, though I do tend to wonder how well these games work out in the home marketplace. The online battle options will probably be a big key to success. Treasure Adventure World was one of the few games on the floor that I had actually seen before, but it’s more polished every time I see it. It describes itself as an “epic Metroidvania,” which could have made it an awkward fit for a show environment, but there are several pre-prepared demos that made playing it on a show floor go pretty smoothly. The hook – pun intended – is that you play a young treasure hunting pirate seeing treasures across the globe. I’ve seen this evolve over the past couple of years and I think it has a lot of potential to be super cool when it’s all done. 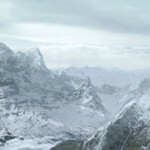 The current demo is free at the Treasure Adventure World web site. My only concern about this one is that it’s been in development for a long time and delayed several times, but that does seem to be a common problem with big scale indie games. It’s easy to not be sure when exactly it will be done, so consider this a “done when it’s done” title. One common gametype at MIVS seemed to be the twin stick shooter. The Xbox 360 controller has become the PC controller of choice, which makes it a natural fit for lots of new variations on the twin stick format. The challenge here in a genre that has a lot of competition is that tight gameplay isn’t enough: you need to come up with some twist that stands out. 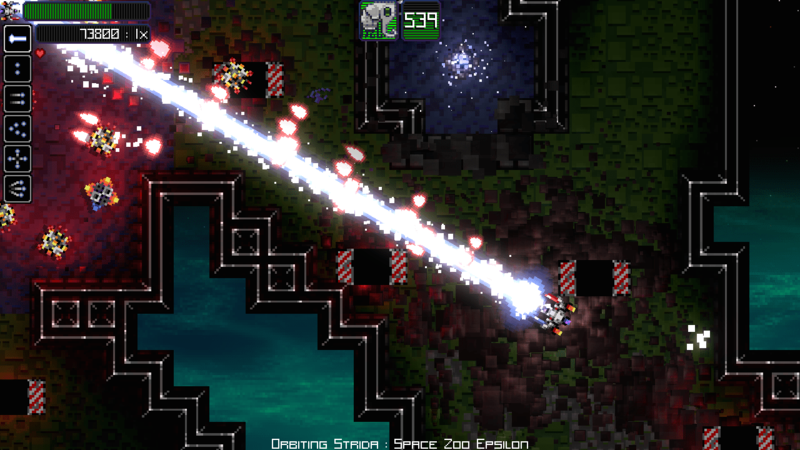 Some examples: In Canari, the twin stick formula is combined with a procedurally generated level and very limited visibility, making for more of an exploration game than a pure shooter. 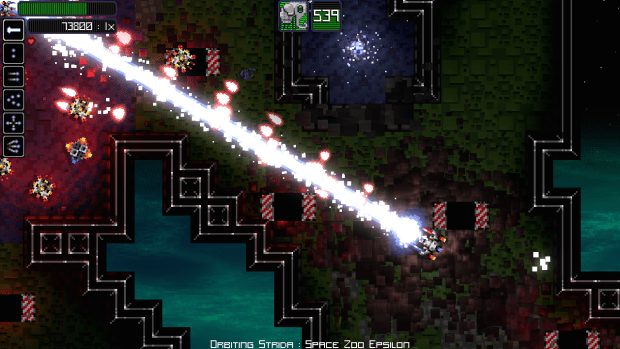 The game Dr. Spacezoo seemed to be partially inspired by the “save/kill the animals” dilemma in the Awesome Games Done Quick speedrun events. In this game, the player is tasked with shooting drone robots while collecting friendly animals. This had tight controls and the push-pull between rescuing animals and shooting enemies was pretty satisfying once I got the hang of it. I also tried out Space Cats in Space, a shooter with characters that seemed inspired by the Star Fox series. The primary twist in Space Cats is a bomber companion that follows the player around and can be directed to take out environmental obstacles. Given that the player is effectively managing two ships at once, and the primary ship has a huge variety of secondary weapons, things in Space Cat Space blow up real good. Space Cats in Space has a free demo on its Icht.io page. Near the end of the festival, I was upstairs chatting at the end of a panel, and a few people insisted that I go back down to the game floor to try Just Shapes & Beats – a game they described as a shooter without the shooting. The game is a co-operative game, and the objective is simple: survive, while being bombarded with enemy shapes on all sides. 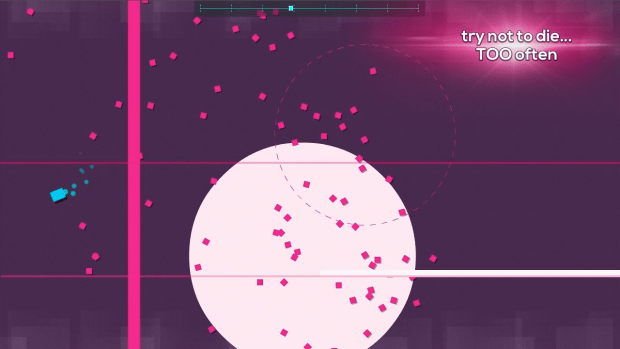 Each player driven shape “ship” has the control precision of the ship in a bullet hell game, but Just Shapes & Beats doesn’t bother with letting the player return fire. The patterns of the enemies are set in time to music, and finishing a song is finishing a level. The premise reminded me of Bit.Trip Runner, but Just Shapes & Beats is a bit more forgiving, allowing players to take a couple of hits before restoring the song to a checkpoint, and for co-op players to help one another out with well timed rescues. The levels in the demo started out with a few songs from Danimal Cannon, which… is just so MAGFest. That brings me, briefly, to discussing the other heart of MAGFest: the music. Someday I will have it in me to really dig deep into the history of how game music somehow became just regular music. For now, I’ll say simply that there’s a real magic in the idea that there are entire festivals dedicated to the place where games and music intersect. When I was a teenager, recording video game music directly from the games, I remember being shocked to realize that just one time in Japan, an orchestra played this music live on stage. Now such concerts happen all over the world, and are responsible in part for a resurgence of young people going to the symphony. Rapping over video game music used to seem strange to me too; now, even Kanye is doing it. At MAGFest, I got to hear MegaRan rapping about Final Fantasy and Street Fighter, get called “garbage” by the DJ at an Undertale dance party, and see Manami Matsumae live on stage with a band playing music she composed for a little game called Mega Man. But the best part of all that was the thousands of people all right there enjoying it with me. Where games and music intersect lies a beautiful community, and I’m happy to be a part of it. I’d love to have come along to this, or have an equivalent in the UK. Sounds like a perfect mix! Combat Core I think I saw at EGX — looked very Power Stone and it made me realise how much I miss Power Stone. Unfortunately I didn’t get a chance to play it but I believe my brother did and he enjoyed it. I don’t play twin-shooters often but I certainly appreciate them in short bursts. The last one I played was Assault Android Cactus which is absolutely worth a look. In fact I may have a copy lying around if you’re interested? I’ve loved game music ever since I had a Commodore Amiga (which had the most bitchin’ sound hardware) so naturally it’s been a huge part of my life for almost as long as I can remember. I can pinpoint the exact moment I fell in love however, and that was when my uncle bought me Turrican for Christmas. I remember us firing it up and being presented with this: https://youtu.be/HGxMDxGJXuo We used to sit there air guitaring and drumming throughout it. So good! Who needed the actual game, eh? A few years ago I went to a Video Games Live concert and it was fantastic and the first live orchestra I’d ever seen so, yeah, there it is. What’s the Kanye track out of interest? My friend, and a relatively experienced gamer who I play most multiplayer games with, sounded surprised when I told him my MP3 player has a lot of game music on it. When I pressed him on his reaction he said “But doesn’t it sound a bit… (long pause) game-y?” This is a guy who’s played Shadow of the Colossus and Machinarium! I think game music probably started reaching a sort of critical mass or wide(r)spread acceptance when the Playstation came along: http://www.theguardian.com/technology/2014/dec/03/how-playstation-infiltrated-youth-culture I think that’s a really good place to start. It seems really important to me as a Brit at least. I haven’t played Undertale but I heard a track from it the other day, called… Megalovania? It was a bit of a monster I’ve got to say. Like AJ, I remember recording game music straight from the games back in the day. A lot has changed since then, and stuff like MAGFest and the Video Games Live concert are totally worth it even for people who aren’t connoisseurs. The latter’s production values and screen show really make it into a thunderous experience, while MAGFest does a great job showing off stuff that’s playable and in development at the same time as it focuses on the power of audio. Treasure Adventure World is a new one to me, I’ll check out the demo! The term “metroidvania” still doesn’t roll off the tongue, but some of the games in that style are fantastic. Thanks AJ! And in it, they will Stalk.